CCDSharp is a freeware program available from SBIG. As the title suggests, it is used to sharpen astronomical images (FITS files). It does this by applying the Richardson-Lucy Deconvolution algorithm to the image. Which stars should be used to determine the "Point Spread Function" for the algorithm. Choose stars that are not saturated. How many iterations of the deconvolution algorithm to run. Many factors come into play, so this is determined for a particular imaging setup by trial and error. It's best to start with a small number (1), and see what happens when the deconvolution is run with higher numbers. At some point, artifacts will begin to appear, and/or the image will start to take on an unrealistic appearance with hard edges. Use the number of iterations that will provide some sharpening, but no objectionable artifacts. Load the FITS file that is to be deconvolved. If necesary, adjust the "back" and "range" numbers so that a representative sample of stars can be viewed. Click on the red plus sign in the tool bar at the top of the screen, and then click on up to eight stars in the image. 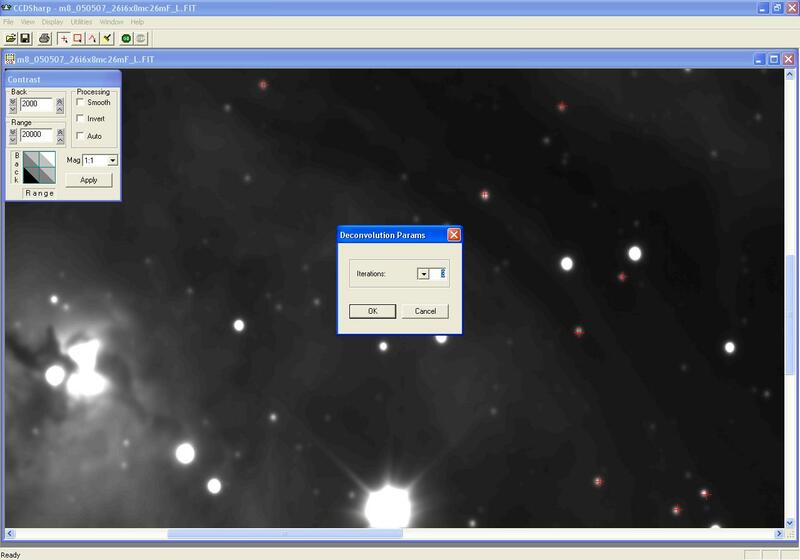 For best results, select stars that are not close to other stars or image features, and that are not saturated. It is not necessary to exactly center the red crosses on the selected stars. Click on the green GO button in the tool bar at the top of the screen. In the popup-window, select the number of iterations to execute. Click the OK button to start the deconvolution. Deconvolution is a very computationally intense operation. The 20-meg SBIG STL-11000m files take about 40 minutes for a 3-iteration CCDSharp deconvolution on a 3 Ghz PC. 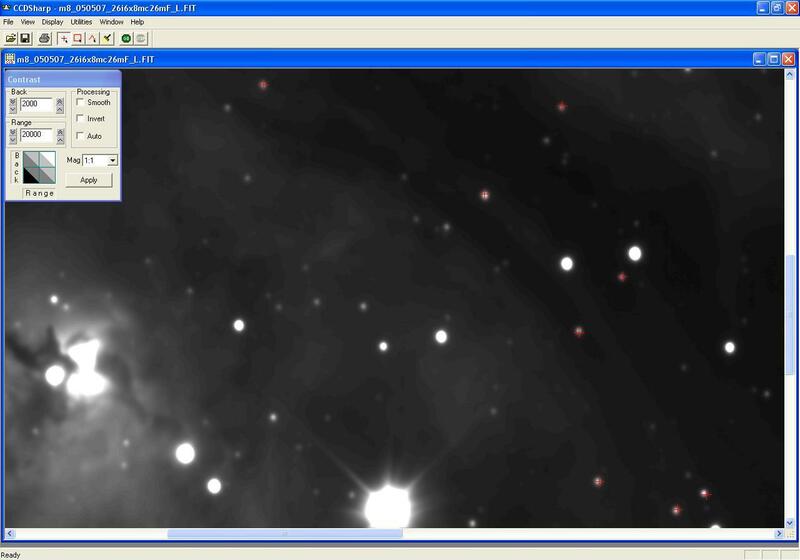 The status bar at the bottom of the CCDSharp screen will indicate the status of the ongoing deconvolution progress, and will list Deconvolution Complete when it has been completed. Save the file. It is a good idea to rename the file when saving it so that you don't lose the original non-deconvolved file. You may want to use it as a starting point later for another number of iterations, or try another program for deconvolution. If you can open two browser windows and switch back and forth between this image and the first one above, you will clearly see the improvement made by the deconvolution routine.